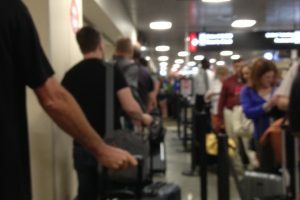 TSA airport security lines haven’t been as bad as we all feared they would be this summer of 2016, given the flaws in TSA’s capacity management practices. The MiddleSeat column for the Wall Street Journal explains why. We could call this a “back to basics” story, and while we all should be glad, we should also ask why it has taken 15 years for TSA Lean management improvements to finally be implemented — things that any analytical person with a pair of eyes could see needed to be done. Expanded manpower by delaying nonessential training and limiting summer vacations for agents. Airports helped out by providing workers to replenish empty bins and other basic tasks so that the trained agents could do what they were trained to do. Congress shifted $26 million in funds to allow hiring 768 screeners and 1000 part timers are now full timers. The “transformative change” has been the command center that holds morning meetings with the TSA directors and reps from airlines and airports at the 30 busiest airports to discuss the challenges of the day. But look at the management and operational changes. Anything earth shattering here? If a TSA senior manager gave a talk at your industry conference about their turnaround story, how “wowed” would you be? They applied basic tenets of management along with some Lean management practices. My takeaway is that TSA has never had on staff or brought in any operational efficiency experts to examine their operational design. If they did, I hope the checks bounced. I can guarantee you that if I had student groups from my operations management classes perform field projects to observe, analyze, and recommend, they would have identified these problems and come up with many of these ideas – and more. It has space for five people to prep their belongings to be screened! Wow! Student groups would have identified this “work station” as a serious bottleneck by applying process analysis we teach in week 1. The new system automatically returns empty bins and will kick out a bag identified for extra screening by the agents rather than make the agents get out of their chair and manually pull the bag! Students again would have applied Lean concepts to identify this wasted movement — muda. Haven’t we all seen those problems and wondered why TSA does things so inefficiently? I’ve looked down and bit my tongue many times. To be fair, TSA screening operations were hodgepodge systems squeezed into cramped areas of the airport post 9-11. We all could see that, and many of the operations improved their design. But even in brand new screening areas, such as Boston’s Logan Airport, Terminal C, “not Lean” practices have been built into the facility design. If a private sector company that faced smart competition applied the antiquated process design that TSA has been using for 15 years, they would have long ago gone into the dustbin of business history. I am glad that TSA is learning, but why do we as taxpayers tolerate such a lack of basic management skills? Why should it be “remarkable” for a government agency to change and to operate efficiently and effectively?